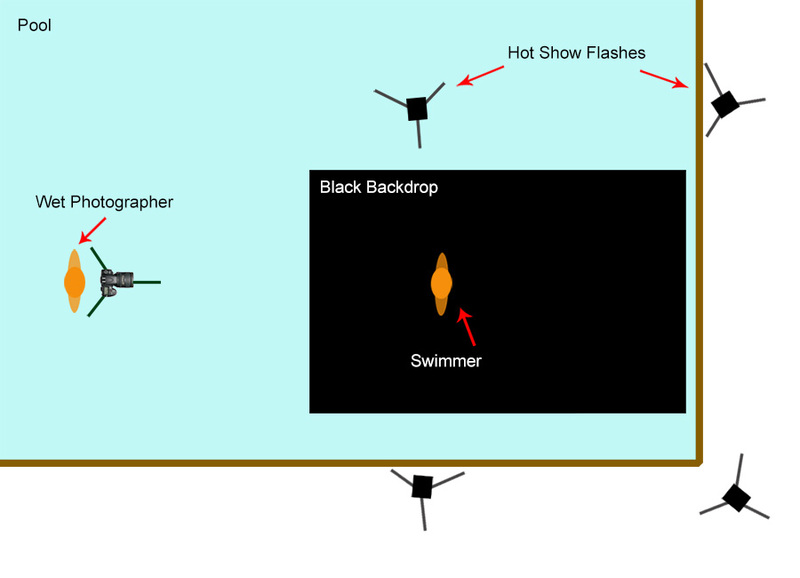 My original idea was to create an image with a swimmer bursting from the water against a pure black background. The water itself had to be lit so that it shone against the black. The angle that I had in mind meant I would also be in the water with a telephoto lens compressing distance and allowing a relatively small background to fill the frame. The setup ended up using four hotshoe flashes which were all triggered by a Phottix Stratos II radio trigger. 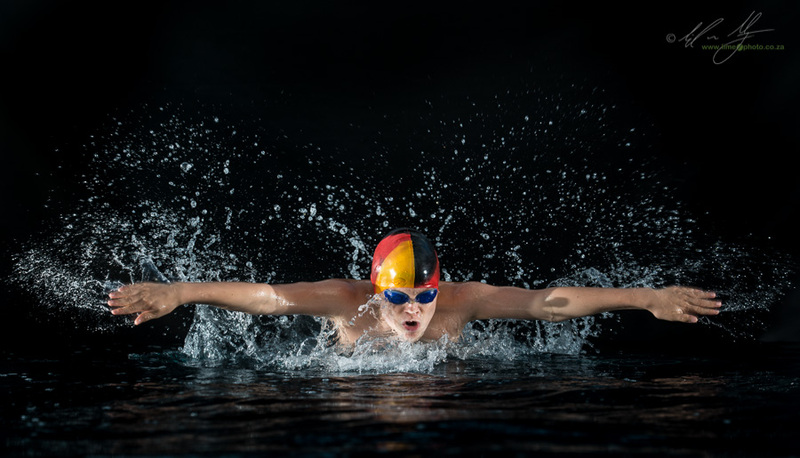 If you imagine a rectangle, the swimmer would be close to one of the long sides while the four flashes would all be on the corners facing towards the swimmer. 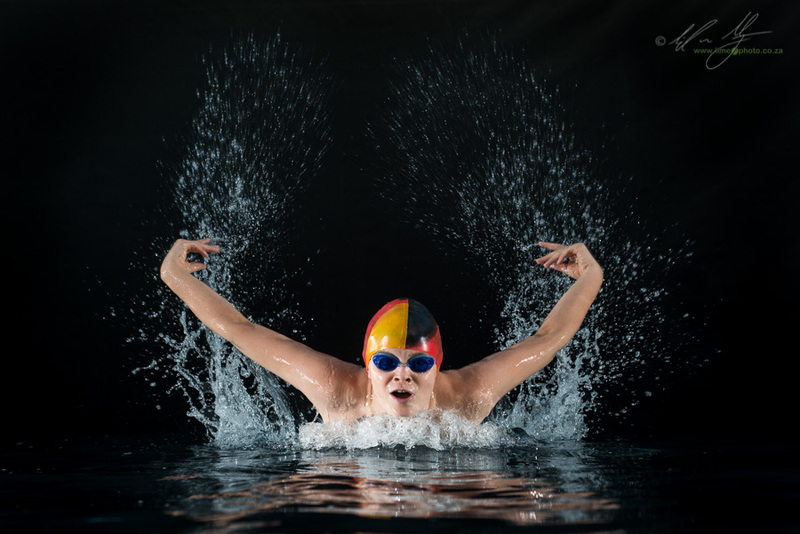 This gave back-lighting for lighting up the water and giving a bit or rim-light to the swimmer, and the other two lights would give hard side lighting to the face and body. When I say hard, all the flashes were zoomed in and bare (sans modifier of any sort). The lack of modifier was also for pragmatic reasons: working close to and in the pool meant that flashes could easily topple into the water. To stop flashes from landing in the drink, I dropped old hollow ceramic wall bricks down the shaft of the light stands that were in the water. That and prayer to the photography gods stopped any dunkings. The actual backdrop was also submerged. I used one of the durable poly-vinyl backdrops which are obviously waterproof. The only real issue here was getting the drop onto the floor of the pool (I used the shallow end of the pool for obvious reasons). Being a big flat sheet it took some time to get it from wafting around in the water to actually lying on the bottom of the pool. If I have to do this again, and I'd like to, I would get a second backdrop to make the length below hte swimmer longer. Due to the refraction caused by water the swimmer could be almost two meters from the edge of the black backdrop below, but I would still see blue reflection in the water of the pool floor. This meant pushing the whole setup further towards the wall of the backdrop, which created complications with waves against the backdrop itself, causing the occasional semi-collapse of the backdrop stands (done in slow motion because of the water, so easy enough to catch and correct). Overall it was a really fun shoot. The setup took almost an hour, and the shoot itself was over in about 20 minutes. the results, I think, are worth it. 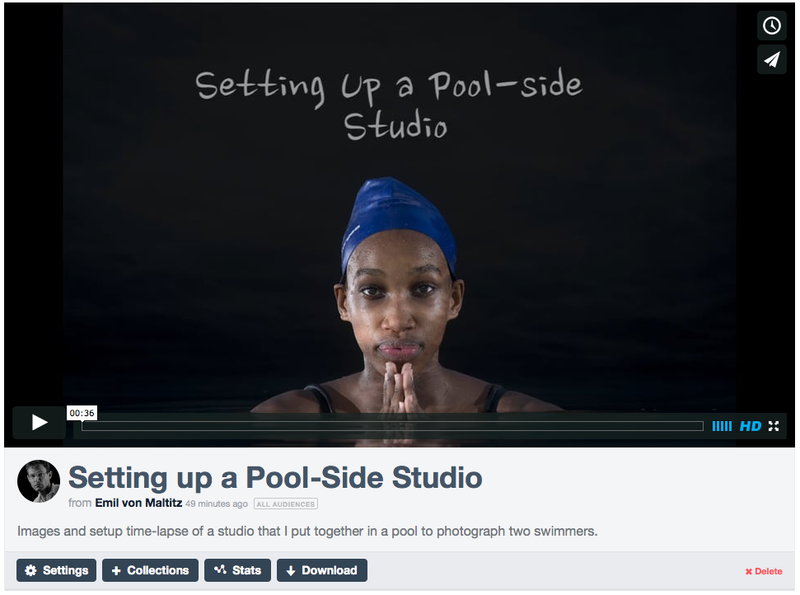 You can watch the time-lapse video of the setup process by following this link to vimeo.